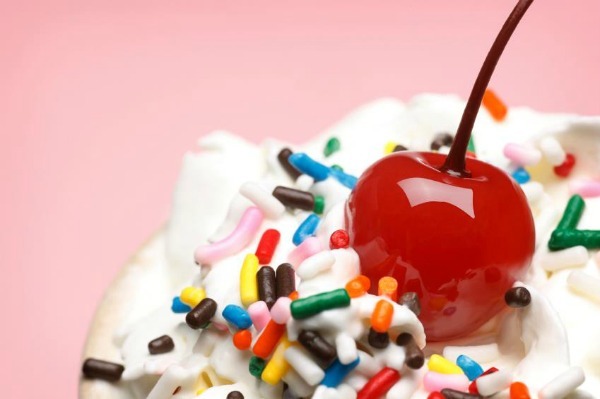 At the end of a long, hot summer day, there’s nothing better than a decadent ice cream sundae with a cherry on top. But how should you arrange all the toppings and tools? Read on to discover how to assemble the perfect sundae bar for your family. Chocolate sprinkles, banana slices and hot fudge — oh my! When it comes to ice cream sundaes, you can go through an endless number of scrumptious combinations to savor. Stock up on the tastiest toppings and get creative with the perfect table decor. Head on over to Pinterest for more sundae bar inspiration! Showcase your family’s signature sundae. Write up the key ingredients and post them on a tent card near the sundae. Encourage family members to add additional toppings and ingredients for variations of your family staple. The right tools can make all the difference in setting up an organized family sundae bar. Display classic sundae glasses, cones, decorative bowls, long spoons, easy-to-use ice cream scoopers and napkins. Set your ice cream containers in a galvanized tub full of ice to keep them properly chilled. Be sure to have one scooper per ice cream flavor so you don’t have to wash it between flavors. Now for the fun part! During your next family dinner or game night, find out which toppings your family would like to see at the next family sundae bar. Jot the ideas down and add them to your next grocery list. Type up cute signage with the name of each topping, just like this ice cream station. Set tiny plastic spoons inside each topping container so toppings don’t get mixed together. Then, add on some creative extras. For starters, present a platter of warm chocolate-chip cookies. Family members can add these to their sundaes for an additional topping, or use them to make their own ice-cream sandwich. Another fun, refreshing option? Serve bottles of root beer on ice for family members to create their own root beer float! Add the bottles to your tub of ice cream to simplify your table. Dip the tops of your cones in melted chocolate for an extra dose of deliciousness!